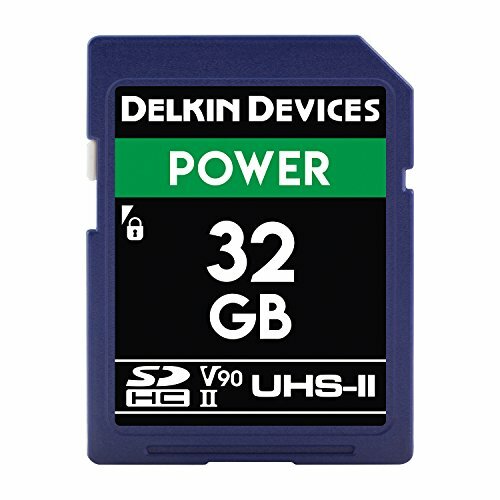 Ideal for professional photographers and videographers, the Delkin Devices Power UHS-II (U3/V90) SD memory card delivers speeds capable of capturing the most demanding video modes of today and tomorrow’s cameras, including 8K, 4K, 3D, HDR, 360º & high-speed recording. The Power SD card utilizes the latest speed class technology, Video Speed Class 90 (V90), while boasting recording speeds surpassing 250MB/s to support data-intensive simultaneous multi-file recording and ensuring that data is written swiftly and safely to the card. It is also approved for real-time broadcasting and supports continuous-burst shooting; capture rapid-fire RAW shots without delay. Capable of offloading data at speeds reaching up to 300MB/s, the Power SD card ensures the quickest, most efficient data transfer from card to computer for immediate access to your files and sooner post-production start time. Built to endure even the most strenuous shooting environments, the Power SD card is durably designed to be waterproof, shockproof and X-ray proof. In addition, the card also utilizes built-in error-correction and wear-leveling to ensure data integrity and a long lifespan. Each card is furthermore backed by a Lifetime Warranty and Delkin’s American-based customer support team out of San Diego, CA.